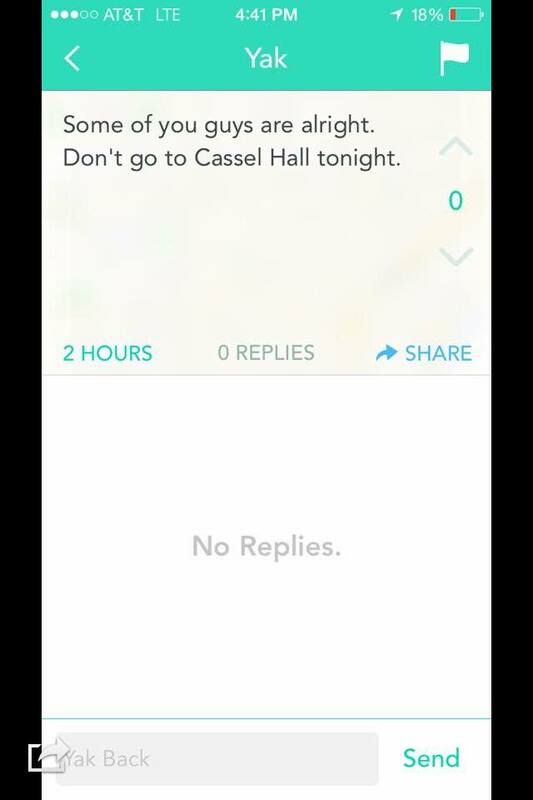 The Yik Yak post that sparked controversy at Cassell Hall. On the afternoon of Monday, October 12, campus police sent an email to faculty and staff about a non-specific threat that was made to Cassell Hall over the Yik Yak social network. Another email was sent out in the evening to alert the campus community that the issue had been resolved. The post in question stated: “Some of you guys are alright. Don’t go to Cassel [sic] Hall tonight.” The post was on Yik Yak for over two hours before being taken down. Professors had mixed emotions about how the threat was handled and how information was made available to the campus population. Dr. Melissa Marks, an associate professor of education and director of the secondary education program, teaches Educational Psychology in Cassell Hall on Monday nights. Marks believed non-ENS emails were a good choice on campus police’s part. “[The threat] was very ambiguous, and [an ENS alert] could have created a real panic,” she said. Sharon Turchick, an assistant professor of management accounting, who teaches Senior Project for Accounting and Business Management with Dr. Ewa Rudnicka in Cassell Hall on Monday nights, did not feel the same way. Despite their differing opinions, both teachers, as well as others in the building, were able to make arrangements so that their students felt safe in their learning environment. Zach Mozingo, a junior Biology Secondary Education major, was in Marks’ Educational Psychology class the night the threat was issued. He first heard about it from word of mouth. He was happy that Marks opted to move the class to another location. Turchick and Rudnicka’s class found out about the crime alert after class had already started. Students were using their computers and were checking their emails during class time. Rudnicka told students that if they felt unsafe that they could leave or relocate their group work to another location on campus. After any threat to campus security, one question always comes up: is our campus safe? “I’ve never felt unsafe on this campus,” Turchick said. On the night of the threat, she walked out of her classroom and up and down the hallway but it seemed as if nothing was happening in the building. “You have to err on the side of caution,” she said. Classrooms at Pitt-Greensburg are supposed to be equipped with “Classroom Emergency Kits,” put together by campus police. Turchick looked for an emergency kit in her Cassell Hall classroom but was unable to find one. She emailed campus police to alert them the classroom was unequipped but as of press time she has not gotten a response. The status of the investigation into the Yik Yak threat is unknown. The University of Pittsburgh at Greensburg’s Chief of Police, Daniel Lynch, stated that the department cannot comment at this time because of ongoing investigations and possible charges in the case. However, campus security’s crime log book has been updated to say that charges have been filed in the case.